Work on the Cool Earth project started on Monday. 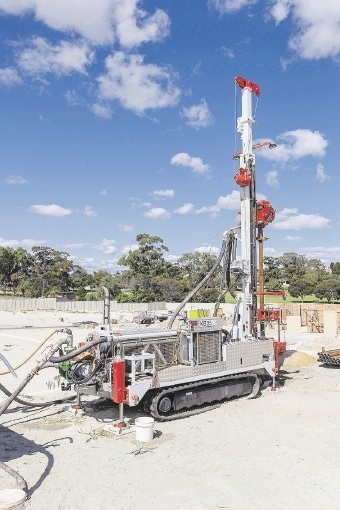 In a first for WA, a 60m deep, 150mm wide hole was dug on Monday in LandCorp�s The Vive estate to trial the use of geoexchange technology. �Compared to standard airconditioners, geoexchange systems do not burn anywhere near as much fossil fuel; they simply transfer heat to and from the earth to provide a more affordable and environmentally friendly method of heating and cooling,� he said. �This technology could significantly reduce energy bills for WA families. This kind of technology is already being used around the world, generally for heating in cold climates, but it is possible it could also be a more efficient, cost-effective and environmentally-friendly way for West Australians to keep cool in summer. As part of the study, LandCorp is building two homes side by side, one with the new technology and one without, to directly compare how the systems perform in our climate over two years. The two houses will be released as turnkey house and land packages in early 2016. Also involved in the project are the Alcock Brown-Neaves Group, Carbonomics, the University of WA and GeoExchange Australia.